WONDERING WHEN YOU WILL FEEL BETTER & GET PAST THE SADNESS OF YOUR GRIEF? Because your healing is so important, and because I’ve experienced my own profound grief and am committed to making a difference, I’m offering you a FREE 20 minute consultation to talk about where you are at with your grief journey, and how I can help you feel better while honoring the memory of your loved one. This is not about forgetting your loss or the memories, it is about having someone to walk forward in life with you, someone who understands and can help. Don’t let grief paralyze you from living. We can talk via telephone or Skype, let me know what form of communication you prefer. You will immediately sense my commitment and intuition, as I combine my training, compassionate heart, and personal experience to provide you with support and insight to better days ahead. I listen, inspire and guide you to your own self-awareness while keeping you accountable to where you want to go. We’ll decide together if this one-on-one support is right for you going forward after the free initial consultation. Please email me at joanne@heartachetohealing.com to set up a convenient time for your free call. 1.) What is the difference between coaching & counseling? Coaching is not counseling . . . Coaching begins by recognizing an individual’s ability to heal, address issues, confront challenges and take action. The role of the grief coach is to bring these attributes to the surface at a time when they may not be apparent to a struggling survivor. While therapy or counseling is also centered on healing, the focus is often solely on the individual’s improved emotional state. Coaching involves forging a positive vision for the future and creating strategies for achieving specific life goals with an emphasis on action and accountability. 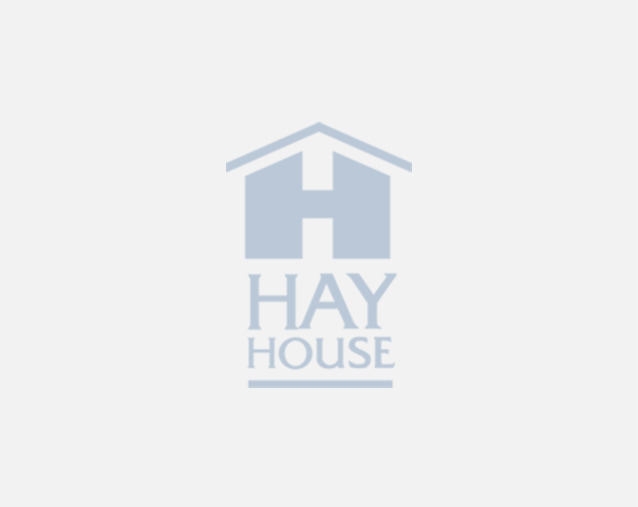 Counseling is generally performed by a licensed psychotherapist and tends to be more passive and often dealing with the past as well as the present. Therapy is almost always face to face. Coaching is task oriented, it begins with the present. The client will be expected to take actions that will deliver desired results. Coaching focuses on what works and encourages action. 2.) What can I expect from coaching? Coaching is for those people who are willing and want to learn and grow from that place they are in now to where they want to be but need some help figuring that out. Grief coaching takes the approach of hope and incorporates the body, mind and spirit in the healing process. Grief isn’t something we recover from like an illness, rather it is a journey that I will help you navigate. I can’t answer the “why” did this happen, but I can help you see more clearly. 3.) How long is coaching expected to last? Generally I offer 1-3 month programs consisting of four-50 minutes private sessions per month. Included are followup emails between calls and brief phone calls in between if needed. The length of your session will be determined in our initial free call. 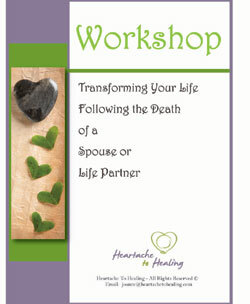 Workshop: Transforming Your Life Following Death of a Spouse or Life Partner. 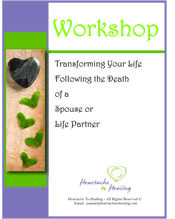 What you will learn in this 6 week workshop will help you to cope with the loss of your spouse, deal with the loneliness and aloneness of being single again as well as fill you with hope while putting meaning back into your life. How to live an empowered life – taking responsibility for living a life of passion & meaning. When an employee suffers the death of a loved one, are you prepared to offer support beyond your company’s standard sick leave & bereavement policy? Will you be an employer that changes your company culture to reflect a more caring environment?According to The Grief Recovery Institute’s 2006 survey called The Grief Index: The Hidden Annual Costs of Grief in America’s Workplace, hidden grief costs U.S. companies more than $75 billion annually in lost productivity, lost business and poor performance. Illnesses or deaths in the family are the second most common problems affecting workplace performance. But other circumstances can produce grief as well, including a divorce, family crisis, financial crisis, and even the death of a pet. Most workplaces allow two to three days of bereavement leave, yet few people have resolved their grief in that timeframe. The Grief Index found that 50% of their respondents reported at least 30 days in which their value to their company was diminished. Another 20% reported they were affected for substantially longer than 30 days. That’s 70% who feel their work was affected for 30 days or more. If companies want to minimize the disruptions and lost productivity caused by grief, they need to help their managers balance a compassionate workplace with a focus on accountable performance. What can companies do? Sherman recommends starting with a little knowledge. Training and workshops for managers: The first step for many companies is to help their managers understand grief and how to manage it. Misconceptions about grief such as ‘ignoring it will make it go away faster’ actually perpetuate it. Managers at any size business need to know how to recognize grief and how to balance supportive nurturing with accountability for job responsibilities.